Dr. Mike Brown is a professor of planetary astronomy at Caltech. He’s best known as the man who killed Pluto, thanks to his team’s discovery of Eris and other Kuiper Belt Objects. We asked him to help us explain this unusual region of our solar system. Soon after Pluto was discovered by Clyde Tombaugh on February 18th, 1930, astronomers began to theorize that Pluto was not alone in the outer Solar System. In time, they began to postulate the existence of other objects in the region, which they would discover by 1992. In short, the existence of the Kuiper Belt – a large debris field at the edge of the Solar System – was theorized before it was ever discovered. The Kuiper Belt (also known as the Edgeworth–Kuiper belt) is a region of the Solar System that exists beyond the eight major planets, extending from the orbit of Neptune (at 30 AU) to approximately 50 AU from the Sun. It is similar to the asteroid belt, in that it contains many small bodies, all remnants from the Solar System’s formation. The Kuiper Belt is a collection of bodies outside the orbit of Neptune that, if nothing else had happened, if Neptune hadn’t formed or if things had gone a little bit better, maybe they could have gotten together themselves and formed the next planet out beyond Neptune. But instead, in the history of the solar system, when Neptune formed it led to these objects not being able to get together, so it’s just this belt of material out beyond Neptune. Shortly after Tombaugh’s discovery of Pluto, astronomers began to ponder the existence of a Trans-Neptunian population of objects in the outer Solar System. The first to suggest this was Freckrick C. Leonard, who began suggesting the existence of “ultra-Neptunian bodies” beyond Pluto that had simply not been discovered yet. That same year, astronomer Armin O. Leuschner suggested that Pluto “may be one of many long-period planetary objects yet to be discovered.” In 1943, in the Journal of the British Astronomical Association, Kenneth Edgeworth further expounded on the subject. According to Edgeworth, the material within the primordial solar nebula beyond Neptune was too widely spaced to condense into planets, and so rather condensed into a myriad of smaller bodies. In 1951, in an article for the journal Astrophysics, that Dutch astronomer Gerard Kuiper speculated on a similar disc having formed early in the Solar System’s evolution. Occasionally one of these objects would wander into the inner Solar System and become a comet. The idea of this “Kuiper Belt” made sense to astronomers. Not only did it help to explain why there were no large planets further out in the Solar System, it also conveniently wrapped up the mystery of where comets came from. In 1980, in the Monthly Notices of the Royal Astronomical Society, Uruguayan astronomer Julio Fernández speculated that a comet belt that lay between 35 and 50 AU would be required to account for the observed number of comets. Following up on Fernández’s work, in 1988 a Canadian team of astronomers (team of Martin Duncan, Tom Quinn and Scott Tremaine) ran a number of computer simulations and determined that the Oort cloud could not account for all short-period comets. With a “belt”, as Fernández described it, added to the formulations, the simulations matched observations. In 1987, astronomer David Jewitt (then at MIT) and then-graduate student Jane Luu began using the telescopes at the Kitt Peak National Observatory in Arizona and the Cerro Tololo Inter-American Observatory in Chile to search the outer Solar System. In 1988, Jewitt moved to the Institute of Astronomy at the University of Hawaii, and Luu later joined him to work at the University’s Mauna Kea observatory. In their 1988 paper, Tremaine and his colleagues referred to the hypothetical region beyond Neptune as the “Kuiper Belt”, apparently due to the fact that Fernández used the words “Kuiper” and “comet belt” in the opening sentence of his paper. While this has remained the official name, astronomers sometimes use the alternative name Edgeworth-Kuiper belt to credit Edgeworth for his earlier theoretical work. However, some astronomers have gone so far as to claim that neither of these names are correct. For example, Brian G. Marsden – a British astronomer and the longtime director of the Minor Planet Center (MPC) at the Harvard-Smithsonian Center for Astrophysics – claimed that “Neither Edgeworth nor Kuiper wrote about anything remotely like what we are now seeing, but Fred Whipple (the American astronomer who came up with the “dirty snowball” comet hypothesis) did”. Furthermore, David Jewitt commented that, “If anything … Fernández most nearly deserves the credit for predicting the Kuiper Belt.” Because of the controversy associated with its name, the term trans-Neptunian object (TNO) is recommended for objects in the belt by several scientific groups. However, this is considered insufficient by others, since this can mean any object beyond the orbit of Neptune, and not just objects in the Kuiper Belt. This suggests that their surfaces are composed of a wide range of compounds, from dirty ices to hydrocarbons. In 1996, Robert H. Brown et al. obtained spectroscopic data on the KBO 1993 SC, revealing its surface composition to be markedly similar to that of Pluto, as well as Neptune’s moon Triton, possessing large amounts of methane ice. Keeping Pluto company out in the Kuiper belt, are many other objects worthy of mention. Quaoar, Makemake, Haumea, Orcus and Eris are all large icy bodies in the Belt. Several of them even have moons of their own. These are all tremendously far away, and yet, very much within reach. On January 19th, 2006, NASA launched the New Horizons space probe for the sake of studying Pluto, its moons and one or two other Kuiper Belt objects. As of January 15th, 2015, the spacecraft began its approach to the dwarf planet, and is expected to make a flyby by July 14th, 2015. When it reaches the area, astronomers are expecting several interesting photographs of the Kuiper Belt as well. Even more exciting is the fact that surveys of other solar systems indicate that our Solar System isn’t unique. Since 2006, there have been other “Kuiper Belts” (i.e. icy debris belts) discovered around nine other star systems. These appear to fall into two categories: wide belts, with radii of over 50 AU, and narrow belts (like our own Kuiper Belt) with radii of between 20 and 30 AU and relatively sharp boundaries. According to infrared surveys, an estimated 15-20% of solar-type stars are believed to have massive Kuiper-Belt-like structures. Most of these appear to be fairly young, but two star systems – HD 139664 and HD 53143, which were observed by the Hubble Space Telescope in 2006 – are estimated to be 300 million years old. Vast and unexplored, the Kuiper Belt is the source of many comets, and is believed to be the point of origin for all periodic or short-period comet (i.e. ones with an orbit lasting 200 years or less). The most famous of these is Halley’s Comet, which has been active for the past 16,000–200,000 years. We call it a belt, but it’s a very wide belt. It’s something like 45 degrees in extent across the sky – this big swath of material that’s just been churned and churned by Neptune. And these days, instead of making a bigger and bigger body, they’re just colliding and slowly grinding down into dust. 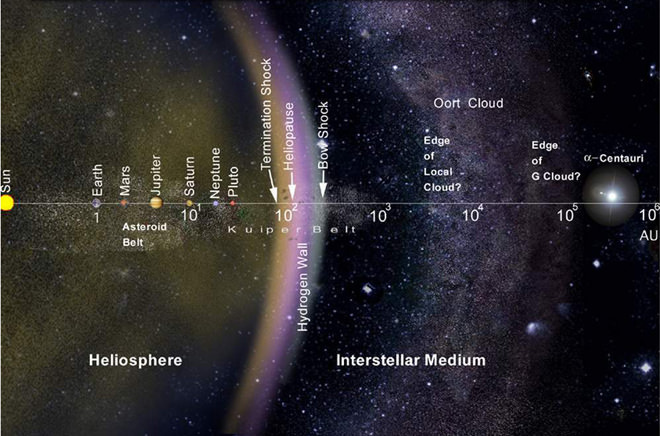 If we come back in another hundred million years, there’ll be no Kuiper Belt left. Given the potential for discovery, and what up-close examination could teach us about the early history of our Solar System, many scientists and astronomers look forward to the day when we can examine the Kuiper Belt in more detail. Here’s hoping that the New Horizons mission is just the beginning of future decades of research into this mysterious region! We have many interesting articles here at Universe Today on the subject on the Outer Solar System and Trans-Neptunion Objects (TNOs). And be sure to check out this article on the planet Eris, the latest dwarf planet and the largest TNO to be discovered. And astronomers are expecting to discover two more large planets in our Solar System. Universe Today also has a full-length interview with Mike Brown from Caltech.